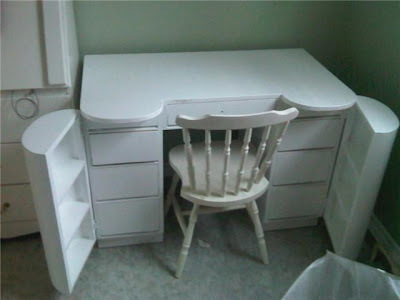 I have had this dresser/makeup table for as long as I can remember. It was my mothers (possibly also my grandmothers... 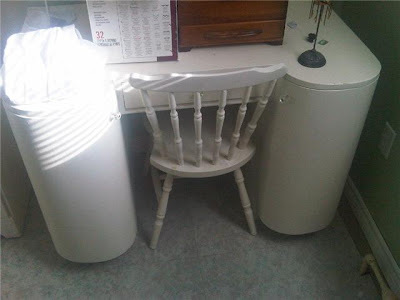 I don't remember) I used it as a dresser when I was little and eventually a make up table. I love it but in the last few years it has needed a serious paint job... I left my hair straightener on one day and burned the top of it...oops!! (can you see the burn mark?) 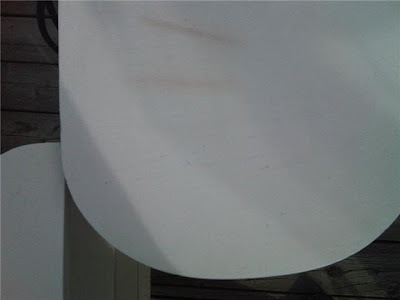 The white paint had also turned yellow from years of the sun and other things hitting it. It was LONG overdue! So last weekend I finally decided to do something about it while Ryan was off golfing. I got him to help me move it outside so I could sand it down and paint it. 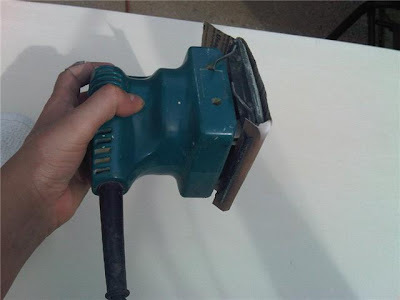 I got out our trusty sander and some sand paper that was lying around and got to work sanding it down so that the paint would stick nicely and not scratch off. OH I forgot how much I LOVE using the sander... power tools are so much fun!!! In about a half hour I had the entire thing sanded down and took a cloth and wiped it down to get rid of the dust. It took awhile to paint it because of all of the curves and the shelves on the doors of the dresser. But eventually I finished one coat of paint and did some gardening while that dried. Then it was time for the second coat which was a lot quicker. I didn't bother painting the insides of the drawers because I had a special project in mind for them. You can see the colour difference... yes they are both white but it was super yellowy before from years of use! Once it was all painted and drying of course it started to rain.. ARGH sooo I had to move it by myself underneath our gazebo.. that was a challenge because this dresser is no Ikea dresser.. it is SOLID wood!!! But MIGHTY MEGHAN prevailed! Eventually I got Ryan to help move it indoors and was very pleased with how WHITE it was again!!! The pictures don't show how yellow it was before the paint job.... But now its white! NOW for my mini drawer project. I'm not sure if you've ever tried buying shelf liner at home depot or if you've even looked at the selections.. they are all very blah and old ladyish. If you're into the pastel blue with pink flowers then you are in luck home depot has PLENTY in stock... but if you want something bright and fun you are out of luck! 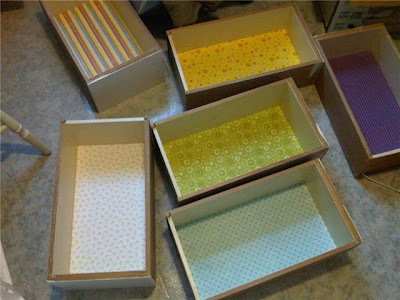 I got the idea to put bright shelf liners in my drawers to spice up my dresser a bit more from one of my favourite blogs Young House Love. (I have turned my dresser into my craft work station for the time being... I have another purpose for it in the future but you'll just have to wait for that redesign). I went to Michael's and bought a bunch of fun coloured paper (you could use wrapping paper as well but I couldn't find any I loved) luckily Michael's had a 20% off sale so each piece of paper was about 80 cents. I cut the paper to the size of the drawer and then I pulled out the Elmers glue and using a sponge I spread a thin layer of glue in the drawer. I put the paper in it and made sure there were no bubbles in the paper. Make sure to only use a small amount of glue or you get bubbles in the paper and it creates a crease which is a pain to get rid of. Then I left it to dry. Next I made my own Mod Podge... (you can use Mod Podge or you can make your own which is cheaper). 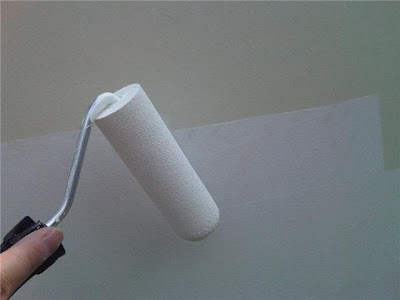 If you have white glue on hand you can use one part glue and 3 parts warm water. It does the exact same thing as an over coat that Mod Podge does at a fraction of the price. So I made my glossy finishing (Mod Podge) and using a paint brush I painted a thin layer on top of the paper to ceil it in. And thats how I transformed my dresser drawers into fun colourful drawers!!!! Look at all of my drawers drying!!! Aren't they fun and colourful! !